Paul Schilperoord is a Dutch engineer and serious car enthusiast. For the past few years he’s made it his life’s mission to restore Josef Ganz to his rightful role in automotive history. Ganz, was a Jewish engineer and journalist who was a consultant to BMW on their first in-house automobile design, the AM1 3-20, and also worked for Mercedes Benz on the revolutionary rear engined 130 (Ganz argued for a midengine design, calling the 130’s inline 4 cyl “an outboard motor”) and much more significant 170 models, being one of the world’s experts on swing axle rear suspensions. Most importantly, as the editor of Motor Kritik magazine and in his role as consulting engineer her popularized the notion of a “volkswagen” or popularly priced people’s car. Schilperoord argues rather convincingly that the cars Ganz designed for the Standard Superior car in 1933 and 1934 appear to have been cribbed by Ferdinand Porsche for the Beetle. After his arrest by the Gestapo on trumped up charges of trying to extort Volksdeutch controlled Tatra over infringements on his patents, Ganz escaped to Switzerland, where he continued to design small cars, and finally emigrated to Australia, where he worked for Holden in obscurity. The Dutch edition of Paul’s book, The True Story of the Beetle: How Hitler Stole the Design of a Jewish Genius (Het ware verhaal van de Kever: hoe Hitler het ontwerp van een Joods genie confisqueerde“), was published in Sept. 2009 and is now in a second printing after the first sold out. Since then, Portuguese (Beetles are very popular in Brazil) and German editions have been published to favorable reviews. Now, an English edition is finished. 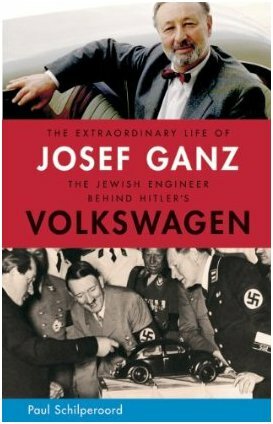 The Extraordinary Life of Josef Ganz – The Jewish Engineer Behind Hitler’s Volkswagen will be released by René van Praag Publishers (RVPP) in November 2011 in the US, UK and other global markets. Amazon is starting to take pre-orders. Schilperoord has promised us a review copy and we’ll be reviewing it when it arrives. Having corresponded with Paul for years now and having seen the amount of research and documentation that went into the original Dutch edition, I’m sure that you’ll find the English version a worthwhile addition to your library of books on automotive history. This book will be of interest to not just VW enthusiasts but anyone with an interest in automotive history or the events in Germany of the 1930s and 1940s.